I especially enjoyed Shostakovich. In September 2011 I wrote a blogpost about how I experienced classical music. In it, I described how listening to 'Lark ascending' in a room full of people, most of which I hardly knew at the time, made me feel. I was swept away by the music but I didn't feel too comfortable to give in to that feeling because of the people around me. This time, knowing that Roeland was sitting next to me made me feel comfortable enough to let go and forget about the rest of the audience, to close my eyes and let the music carry me away. It was a wonderful experience. Yay for friends who invite me to things that I wouldn't have tried on my own but prove to be fun! Earlier that day a package was delivered, containing Project Life's Seafoam edition by Elise Blaha Cripe. Since January 2012 (and to a lesser extend, before that as well) I've been using a method of documentation that is sort of my own version of Project Life. For non-scrappies: Project Life is the brainchild of scrapbooker Becky Higgins. In traditional scrapbooking, each and every page of your scrapbookalbum is a decorated page with photo's, and often journalling. In Project Life, you use devided page protectors and fill up the pockets with photo's journallingcards, ephemera and/or small decorated cards. The pockets measure 3x4" and 4x6" (and I believe they have a version with 4x4" now). The pageprotectors are made to be used in three-ring binders. And that's why I don't use them. I like to be able to add all sorts of page protectors into my albums and use my holepunch to create pages of my own to add. And since four-ring is the standard here and my holepunch punches four holes, I would feel too limited when using a three-ring binder. So I bought four-ring binders and all kinds of page protectors, and usually mix page protectors with 2,5x3,5" pockets (ATC-size) and 4x6" pockets, one of both for each week, and add extra page protectors or other kinds of pages as needed. Depending on how much activities and stuff a month holds, one of my binders can hold half a month up to two months. Once in a while I try a different type of photo-album for the duration of a month, just to keep things fresh. Another difference in my approach is that I don't print my photo's weekly, like many project lifers do. To keep things affordable, I save up the photo's that I want to have printed untill there's a promotion. Now I might not use the albums and page protectors of project life, but I really liked the design of the seafoam edition. I've been a fan of Elise's scrapbookingstyle and reader of her blog for years now, and once took an online workshop with her on making mini-albums. And now my studies and my two volunteerjobs are making it hard for me to find time for working on my photo- albums, even though documenting my life trough words and photo's is still important to me, I'm always on the look-out for 2,5x3,5" and 4x6" cards to use in the pockets. I have yet to find nice atc-sized journallingcards (and I'd pretty much kill for a sturdy ATC-sized punch so I don't have to sit down with pencil, ruler and eraser every month! ), but I figured I could use the 4x6" ones from PL, and use the 3x4" ones either to share a pocket with a half-sized photo or on a blank 4x6 card to which I could other stuff as wel, or on lay-outs. Martijn and Jill came over for a late birthday celebration. They gave me a bookstore giftcard and a bottle of Starbucks hazelnut sirup. I've tried it in my hot chocolate, in a banana milkshake, with pears and chocolate sauce, in banana-chocolate cake and in my cereals (not a succes with yoghurt!). Any other suggestions? I worked on the course Geschiedenis van het privéleven (History of the private life), that I had started during our stay in Poland. It's about what objects, private documents and photo's can teach us about the past. I started the free online course 'Cultureel erfgoed' (cultural heritage), developed by two teachers of the Dutch Open University. It's part of the 'OU Erfgoedplatform' (heritage platform), they have a website and are active on facebook, where I have been participating in conversations on heritage topics. I really like this initiative! I visited the Museum for Modern Art Arnhem, to see the exhibition 'In de schaduw van morgen: Neorealisme in Nederland' ('In the shadow of tomorrow: Neorealism in the Netherlands'). On my way back home, I stopped in Utrecht to see the exhibition 'Ontsnapt aan de beeldenstorm: Middeleeuwse beeldhouwkunst' ('Surviving the iconoclasm: Medieval sculpture') at Museum Catharijneconvent, which was more up my alley. Maarten and I visited the Groninger Museum to see the exhibition 'Nordic Art', which we both liked. We also saw the rest of the museum and went into town for a bit. Roeland and I spent a day in Amsterdam. We visited the exhibition 'De Gouden Eeuw, proeftuin van onze wereld' ('The golden age: gateway to our world') at the Amsterdam Museum, the Portuguese Synagoge and the Joods Historisch Museum (Jewish Historical Museum) to see the exhibition 'Het Amsterdam van Sal Meijer' ('Sal Meijer's Amsterdam'). I went to see the Chinese terracotta warriors at the Volkenkundig Museum in Leiden. After that I met up with Roeland at the Sieboldhuis, a museum on Japan, also in Leiden, to see the exhibition 'Spoken en geesten' ('ghosts and spirits'), which was nice. That evening we attended a lecture on humour in medieval times, we didn't learn much from it. 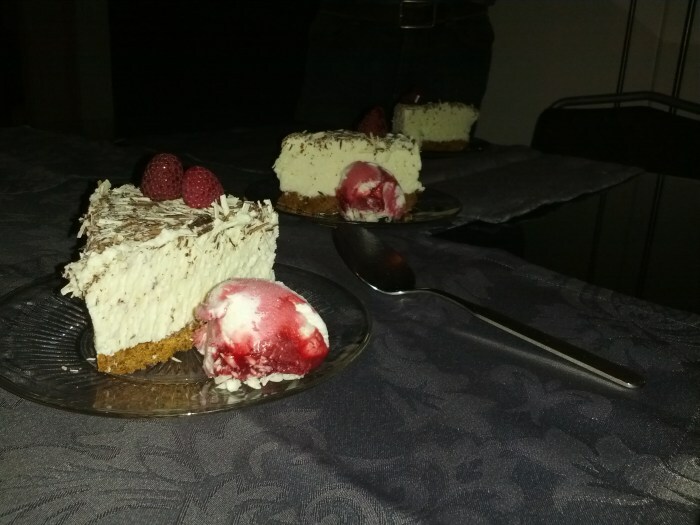 L. posted a photo on facebook of a white-chocolate cheesecake he had made. 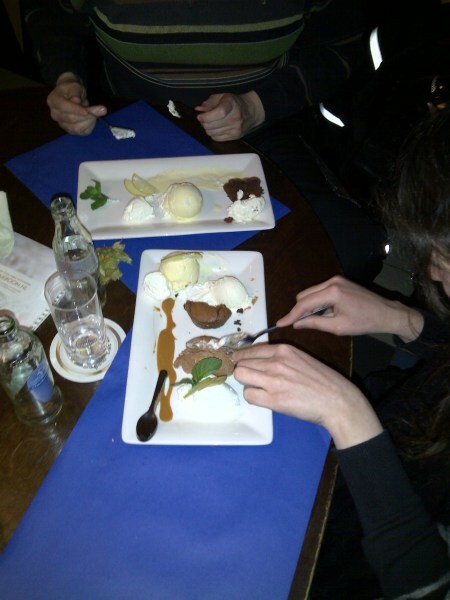 I joked that Maarten and I would come to dinner and have some of his cake for dessert. He joked in response that in that case, he expected me to bring pear-pizza with me (one of my go-to recipes for when we have guests). We actually liked the idea and I had some ripe pears laying around, and Maarten was willing to join us, it was a fun impromptu dinner and the pie tasted pretty d*mn good! I went back to Sieboldhuis to pick up my camera, that I had left there by accident. I took the opportunity to visit the rest of the museum, that I had only seen briefly a couple years back during open monument day. Afterwards I went to a meet-up in a café, such good fun that I decided to stay for dinner. Sharing a chocolate trio, not sure if the person who took the photo would be okay with his name being mentioned so no photo credits here. Roeland and I went to Dordrecht to visit the Dordrechts Museum. I hadn't been there in a while, they have recently renovated and it looked good. We mainly went there to see the exhibition 'Portret in portret' ('Portrait in portrait'). Maarten and I went to see our financial advisor. When we got our mortgage in 2006 we were able to set the interest for a certain rate for the duration of seven years. That period is ending soon so we wanted advice on what would be the best decision in the current market. We were surprised to see that interest rates on mortgages were pretty much the same as in 2006, even though the interest on our savings account has dwindled to a depressingly low figure, barely compensating for the current level of inflation. No other surprises, we'll probably keep the same mortgage and will try to set the interest rate for a somewhat longer time period. 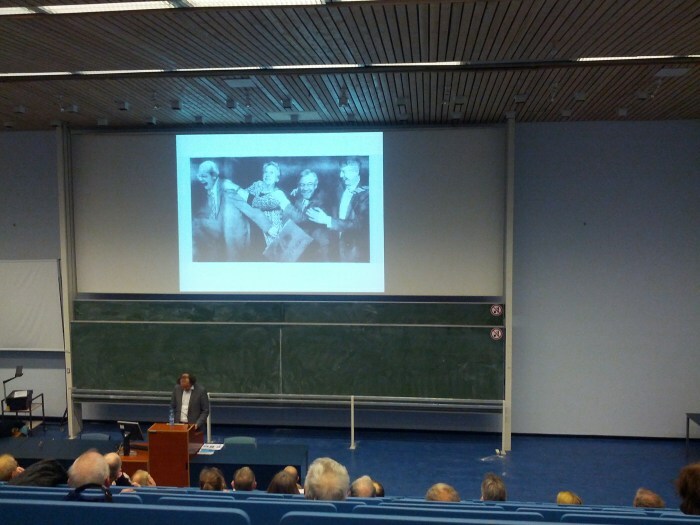 Maarten, Roeland and I went to a lecture on humour in political speeches by Jaap de Jong. Nice, but mostly examples, I would have liked some more theory. The auditorium at the Lipsius building in Leiden where I've spent a lot of time listening to studium generale lectures this past year. E. and I visited the Stedelijk Museum. We took the audio tour. Slowly acquainting myself with the world of modern art, I recognized some artists names of styles from other works I had seen earlier in the month. Frank and I visited 'My dream exhibition' at the Beurs van Berlage. It consists of reproductions of works of Van Gogh, with the colours edited to resemble their original state, which has changed over time in the original paintings. There were also some 3D animations. We spent the rest of the afternoon having a drink in a bar and visiting multiple bookstores. 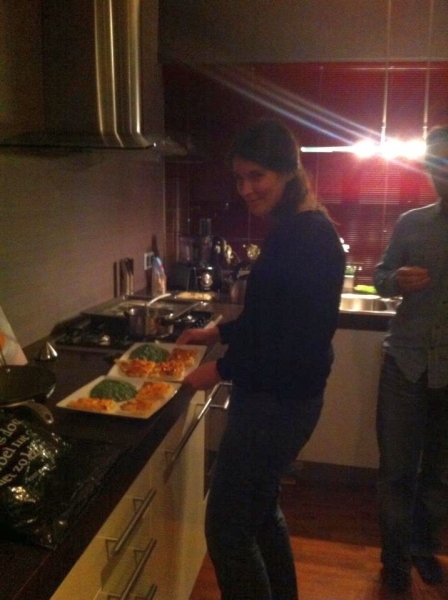 We joined Nicolette, Danja and Maarten in The Hague for dinner at VIP (Very Italian Pizza). Got my hands on the supplement of the Middledutch dictionary at de Sleghte in Amsterdam, I already had the main dictionary. Yay! Apart from working on 'geschiedenis van het privéleven' (History of the private life) I started 'Inleiding kunstgeschiedenis' (introduction to art history), which I'm thoroughly enjoying, but I didn't get as much done as I wanted/should have. I need to set aside more days for my studies. However much I'm enjoying being busy with all these fun things I'm doing, I'm feeling a bit overwhelmed lately by my full-to-the-brim diary and my long to do lists. I'm hoping my new huge planner (40x50cm, almost 16x20") will help me with that. It's from HEMA and it's versatile. You can use is for a family, alotting a column to each family member. You can use a page for 5 weeks, using each column for a different week. I use one page each week. The first column is for appointments, the second for study-related to-do items, the third for things I need to do for Lees ME (the patient magazine for which I am an editor), the fourth for housekeeping chores and grocary shopping and such, and the fifth for random to do items. There usually are no to do items for Museum Meermanno on it, because I usually work at the museum office and don't often need to bring work home. So there's no need for a seperate column for that. I'm very happy to have found this planner, I had been looking for something like this for a while. I need to pay more attention to it and I need to get more realistic about how much I can do in one day. But it's a start, at least I have a place to jot these things down now! On the last day of the month, F+R came for dinner. I made zucchini-goat cheese pie and a salad. R. took care of dessert: fruit salad and icecream. They showed photo's of their trip to Gambia and Senegal. Het zijn weer drukke tijden Thinkie... het mooiste vind ik de foto van die kunstgeschiedenisboeken... schuif ze iets dichter bij elkaar (Vincent tegen die andere kop - wie is dat?) en je hebt een prachtig, nieuw beeld! Cool!! !